The bonnet macaque also known as zati (Macaca radiata) is a macaque endemic to southern India. 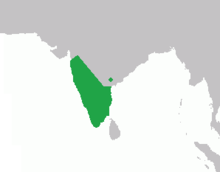 Its distribution is limited by the Indian Ocean on three sides and the Godavari and Tapti Rivers along with a related competing species of rhesus macaque in the north. Land use changes in the last few decades have resulted in changes in its distribution boundaries with the rhesus macaque, raising concern for its status in the wild. This Old World monkey is a diurnal animal. It is 35–60 cm long plus a tail of 35–68 cm. Males weigh 5.5 to 9.0 kg, females 3.5 to 4.5 kg. Captive monkey can live up to 35 years. The bonnet macaque feeds on fruits, nuts, seeds, flowers, invertebrates, and cereals. In southern India, this macaque exists as commensal to humans, feeding on food given by humans and raiding crops and houses. Two subspecies of bonnet macaques have been identified: M. r. radiata and M. r. diluta. The bonnet macaque has a very wide range of gestures and behaviors, which can be easily differentiated. Lip smacking is one of the most common affiliative behaviors, where one individual may open and close its mouth in rapid succession, with its tongue between its teeth and its lips pressing against each other, giving an audible sound. A grimace is the most common gesture of fear or submission that a subordinate shows to a dominant individual during aggressive encounters. It consists of pulling back its upper lip, showing its upper teeth. It also has distinct alarm calls for predators such as pythons and leopards. The bonnet macaque, like other macaques, shares a linear dominance hierarchy; the alpha male is the most dominant male of the troop, followed by a beta male and a gamma male, and so on according to their dominance. Similarly, females also follow this linear hierarchy. The male and female hierarchies are different and of a nonoverlapping or nonmixing types. Males are usually dominant over females. The females' dominance hierarchy is stable (rarely changes), whilst the males' dominance hierarchy is very dynamic. In the male hierarchy, males close in rank often fight to rise in rank. A male has the best chance of obtaining high rank in his prime age, resulting in the greatest benefits to reproduction. High-ranking individuals have first access to breeding females. Females are receptive during only a few months in a year, resulting in competition between males. In this situation, the ranks established by aggressive encounters come into play. Most of these aggressive encounters are easily resolved, but competition between similarly built or similarly aggressive males results in brutal and sometime fatal fights. Different males may employ various means to rise in rank. Coalition formation between unrelated males to oust a more dominant male has been observed. Males often move from troop to troop to gain higher rank with the resulting benefits. However, males remaining in a single troop have been observed to rise to become dominant male of that troop. In the case of females, the stable dominance hierarchy is a result of female philopatry, when individuals tend to remain with the troop into which they are born. This results in the formation of matrilinear groupings of closely related females. These matrilines help each other during antagonistic interactions. As the matrilines are continuously reinforced with new births of females in a troop, ranks rarely change. A few rare cases of rank reversal for females have been recorded in which matrilines have become extremely depleted due to few female births. Male infants would not help to reinforce the matrilines, as they move off to new troops, leaving their natal troops. Wikimedia Commons has media related to Macaca radiata. ^ a b Singh, M.; Kumar, A. & Molur, S. (2008). "Macaca radiata". The IUCN Red List of Threatened Species. IUCN. 2008: e.T12558A3357748. doi:10.2305/IUCN.UK.2008.RLTS.T12558A3357748.en. Retrieved 11 January 2018. ^ a b Groves, C.P. (2005). Wilson, D.E. ; Reeder, D.M. (eds.). Mammal Species of the World: A Taxonomic and Geographic Reference (3rd ed.). Baltimore: Johns Hopkins University Press. p. 164. ISBN 0-801-88221-4. OCLC 62265494. ^ Fooden, Jack (1988) Taxonomy and Evolution of the Sinica Group of Macaques: 6. Interspecific Comparisons and Synthesis. Fieldiana Zoology (New Series) 45. ^ Kumar, R. Radhakrishna; S. Sinha, A (2011). "Of Least Concern? Range Extension by Rhesus Macaques (Macaca mulatta) Threatens Long-Term Survival of Bonnet Macaques (M. radiata) in Peninsular India". International Journal of Primatology. 32 (4): 945. doi:10.1007/s10764-011-9514-y. ^ Govindarajan, Vinita. "South India is losing its endemic bonnet monkey to an aggressive invader from the north". Scroll.in. Retrieved 2017-09-14. ^ Old World Monkeys Archived June 28, 2012, at the Wayback Machine. Animalcorner.co.uk (2004-01-01). Retrieved on 2013-04-25. ^ Brown, M. (2008) Macaca radiata. Animal Diversity Web. ^ bonnet monkey. Merriam-Webster. Retrieved on 2013-04-25. ^ Coss, Richard G.; McCowan, Brenda; Ramakrishnan, Uma (2007). "Threat-Related Acoustical Differences in Alarm Calls by Wild Bonnet Macaques (Macaca radiata) Elicited by Python and Leopard Models" (PDF). Ethology. 113 (4): 352. doi:10.1111/j.1439-0310.2007.01336.x. ^ Friends Help More Promptly, at Least in Monkeys. Sciencedaily.com (2012-07-31). Retrieved on 2013-04-25. ^ Singh, Mewa; Jeyaraj, Tephillah; Prashanth, U.; Kaumanns, Werner (2010). "Male–Male Relationships in Lion-tailed Macaques (Macaca silenus) and Bonnet, Macaques (Macaca radiata)" (PDF). International Journal of Primatology. 32: 167. doi:10.1007/s10764-010-9448-9. Archived from the original (PDF) on 2014-10-14. This page was last edited on 20 November 2018, at 23:20 (UTC).